Believe it or not, there are some people out there that truly believe women are not as funny as men. In fact, the comedy genre, especially of the R-rated variety, has long been a boys-only club. That is until Bridesmaids hit theaters in 2011 to widespread critical and commercial success. Bridesmaids proved that female comedy leads could stand toe-to-toe with their male counterparts and best them in both wit and physical folly. The film was clever, relatable, hilarious, and heartfelt. 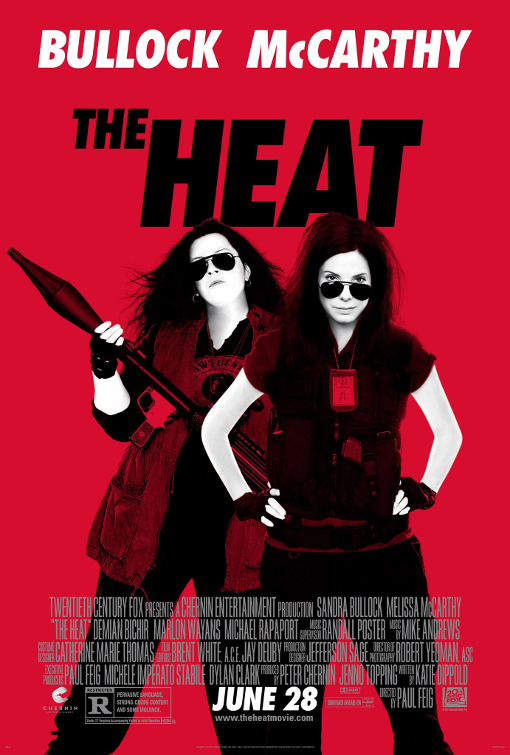 It’s this stage that Bridesmaids director Paul Feig and breakout star Melissa McCarthy step onto for The Heat, a buddy cop comedy starring McCarthy and Sandra Bullock. The flick is pleasant if predictable, garnering a few genuine laughs from ambitious performances, but ultimately The Heat plays too cheap to recapture the magic of Bridesmaids. The Heat opens today in Philly area theaters. Theo– I appreciate the comments and the enthusiasm. For the record, I am a regular guy like you, with a day job and a a state school degree… I do not get paid for these reviews (although that would be awesome). While I do find myself less likely to turn my brain off and simply enjoy a flick for what it is when I am supposed to be thinking critically, I do take the time to digest the movie, its intended audience, and the peripheral aspects; I do not simply knee-jerk to “how do I pick apart this movie so I can sound smart?”. In fact, most of my feedback from other readers has been that I’m too complimentary of films they thought were average. Let me reiterate that I agree with you– The Heat was funny. There were several parts where I laughed out loud. That being said, where would you rank it in the pantheon of R-rated comedy? It doesn’t even come close to the Top 10, let alone 25. The yardstick I start with on each movie is whether I think it’s worth a $15/ticket to see, and if you’re regularly going to the movies, The Heat is a rental. I hear you though– it’s definitely a funny movie that serves up a decent amount of laughs, which is what you paid to see. PS– I knew nothing about the mixers… I’m getting short-changed! I cannot understand all the very negative reviews for this movie. They almost convinced me not to watch it. Fortunately, the decent reviews convinced me to take an chance, and I am glad I did. This movie is as good a comedy as any of the decent comedies to come out in the last two years, of which there were not many. The acting was top class. The script was very funny and the direction was just right. The leads complimented each other perfectly. The pace was very good and kept you interested. Even the slower part which was only a very small portion of the overall movie, but was one of the things which made it more human and easier to relate to. Well worth a look.